Foraminifera, abbreviated as forams, are single-celled amoeboid protists comprising the order Foraminiferida (or Foraminifera of supergroup Rhizaria), characterized by reticulating pseudopods and typically a shell. As organisms traditionally placed as part of the Granuloreticulosea, they tend to posses granuloreticulose pseudopodia, which are temporary, threadlike, cytoplasmic projections that branch and merge to form a dynamic net and that often include grains or tiny particles (Olney 2002; Hemleben et al. 1989). The shells or tests can have either one or multiple chambers, although the simple forms are hollow spheres or open tubes (Wetmore 1995; Kennett and Srinivasan 1983). The name foraminifera ("hole bearers") comes from the connecting hole (foramen) through the wall (septa) between each chamber (Olney 2002). Some tests are quite elaborate in structure. Foraminifera may be planktonic or benthic, are mainly marine, and are found in all marine environments. Mostly less than one millimeters in size, they range from about 100 micrometers to almost 20 centimeters (7.9 inches) (Wetmore 1995). Some foraminifera form symbiotic relationships with algae and some use the chloroplasts from ingested algae to conduct photosynthesis (Bernhard and Bowser 1999). Forams are very important in food chain, providing food for fish, snails, sand dollars, and many other animals. Tens of thousands per square meter may be found in some environments (Wetmore 1995). They also can be used as indicators of ecosystem health. Fossil forams are vast in numbers and diversity. Found as far back as the Cambrian, they are useful for many purposes, including paleoclimatology, paleoceanography, finding oil deposits, and research into the evolutionary process. Generally, extant foraminifera are known as organisms that have a shell (test) and live in marine environments. However, some are naked (lack a shell) and some are found in brackish conditions (Sen Gupta 1999), freshwater environments (Reticulomyxa filosa, Toxisarcon synsuicidica) and even in terrestrial environments in damp soil (Edaphoallogromia australica) (Schweizer 2006; Schweizer et al. 2008). Forams are characterized by pseudopodia called granuloreticulopodia, which form a network and contain granules. For such reasons, they traditionally have been placed in the class Granuloreticulosea, as comprising the order Foraminiferida (ITIS 2003; Olney 2002). As members of Granuloreticulosea, they were grouped with the lobose and filose amoebae as part of the superclass Rhizopoda, subphylum Sacrodina, and phylum Protozoa. However, molecular data has challenged the monophyly of Rhizopoda as well as Granuloreticulosea. Newer classifications include ones that place the forams in the supergroup Rhizaria, a proposed major eukaryote group, and more specifically list them as comprising the Rotaliida or Foraminifera phylum within the taxon Rhizaria, which itself is within the taxon Cabozoa (Schweizer 2006; Schweizer et al. 2008; Adl et al. 2005). There are about 4,000 described living species of foraminifera (Olney 2002). Most are less than 1 millimeter in size, although the largest specimen is almost 20 centimeters in length. Forams are very common in the meiobenthos, and about 40 morphospecies are planktonic (Hemleben 1989). This count may, however, represent only a fraction of actual diversity, since many genetically discrepant species may be morphologically indistinguishable (Kucera and Darling 2002). A number of forms have unicellular algae as endosymbionts, from diverse lineages such as the green algae, red algae, golden algae, diatoms, and dinoflagellates (Hemleben 1989). Some forams are kleptoplastic, retaining chloroplasts from ingested algae to conduct photosynthesis (Bernhard and Bowser 1999). A single foram may have one or numerous nuclei within its cell (Wetmore 1995). The foraminiferal life cycle in complex, involving an alternation between haploid and diploid generations, although they are mostly similar in form. The haploid or gamont initially has a single nucleus, and divides to produce numerous gametes, which typically have two flagella. The diploid or schizont is multinucleate, and after meiosis fragments to produce new gamonts. Multiple rounds of asexual reproduction between sexual generations is not uncommon in benthic forms (Sen Gupta 1999). Foramanifera typically live for about a month (Crowley and Zachos 2000). Although as yet unsupported by morphological correlates, molecular data strongly suggest that foraminifera are closely related to the Cercozoa and Radiolaria, both of which also include amoeboids with complex shells; these three groups make up the aforementioned Rhizaria (Cavalier-Smith 2003). However, the exact relationships of the forams to the other groups and to one another are still not entirely clear. The form and composition of the test is the primary means by which forams are identified and classified (Schweizer 2006}. The cell walls have three basic compositions: organic (portinaceous mucopolysaccharide), agglutinated, and secreted calcium carbonate (Schweizer 2006). Agglutinated forms may be made of randomly acccumulated grains or specifically selected grains (Schweizer 2006). Most forams have calcareous tests, composed of calcium carbonate (Sen Gupta 1999). Secreted tests may be subdivided into three groups as well: microgranular, porcelaneous, and hyaline (Schweizer 2006). There also are some oddities, such as those with tests composed of silica, tests composed of aragonite, and those made with an optically single crystal of calcite (Schweizer 2006). Openings in the test, including those that allow cytoplasm to flow between chambers, are called apertures. Tests are found as fossils as far back as the Cambrian period (Dartnell 2008), and many marine sediments are composed primarily of them. For instance, the limestone that makes up the pyramids of Egypt contains nummulitic benthic foraminifera (Olney 2002). 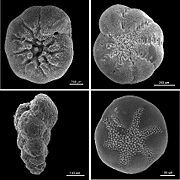 Production estimates indicate that reef foraminifera annually generate approximately 43 million tons of calcium carbonate and thus play an essential role in the production of reef carbonates (Langer et al. 1997). Dying planktonic foraminifera continuously rain down on the sea floor in vast numbers, their mineralized tests preserved as fossils in the accumulating sediment. Beginning in the 1960s, and largely under the auspices of the Deep Sea Drilling, Ocean Drilling, and International Ocean Drilling Programs, as well as for the purposes of oil exploration, advanced deep-sea drilling techniques have been bringing up sediment cores bearing foraminifera fossils by the millions. The effectively unlimited supply of these fossil tests and the relatively high-precision age-control models available for cores has produced an exceptionally high-quality planktonic foraminifera fossil record dating back to the mid-Jurassic, and presents an unparalleled record for scientists testing and documenting the evolutionary process. The exceptional quality of the fossil record has allowed significant research into species inter-relationships, in many cases subsequently validated independently through molecular genetic studies on extant specimens. Because of their diversity, abundance, and complex morphology, fossil foraminiferal assemblages are useful for biostratigraphy, and can accurately give relative dates to rocks. The oil industry relies heavily on microfossils such as forams to find potential oil deposits (Boardman et al. 1987). Calcareous fossil foraminifera are formed from elements found in the ancient seas they lived in. Thus they are very useful in paleoclimatology and paleoceanography. They can be used to reconstruct past climate by examining the stable isotope ratios of oxygen, and the history of the carbon cycle and oceanic productivity by examining the stable isotope ratios of carbon (Zachos et al. 2001). Geographic patterns seen in the fossil records of planktonic forams are also used to reconstruct ancient ocean currents. Because certain types of foraminifera are found only in certain environments, they can be used to figure out the kind of environment under which ancient marine sediments were deposited. For the same reasons they make useful biostratigraphic markers, living foraminiferal assemblages have been used as bioindicators in coastal environments, including indicators of coral reef health. Because calcium carbonate is susceptible to dissolution in acidic conditions, foraminifera may be particularly affected by changing climate and ocean acidification. Foraminifera can also be utilized in archeology in the provenancing of some stone raw material types. Some stone types, such as chert, are commonly found to contain fossilized foraminifera. The types and concentrations of these fossils within a sample of stone can be used to match that sample to a source known to contain the same "fossil signature." ↑ This taxonomy is based on ITIS (2003) and is the standard in many encyclopedic references. However, see text for a more recent alternative taxonomy in which forams are placed in the supergroup of Rhizaria and the phylum Foramnifera. Adl, S. M., A. G. B. Simpson, M. A. Farmer, R. A. Anderson, O. R. Anderson, J. A. Barta, S. M. Bowser, G. Brugerolle, R. A. Fensome, S. Fredericq, T. Y. James, S. Karpov, P. Kugrens, J. Krug, C. E. Lane, L. A. Lewis, J. Lodge, D. H. Lynn, D. G. Mann, R. M. McCourt, L. Mendoza, O. Moestrup, S. E. Mozley-Standridge, T. A. Nerad, C. A. Shearer, A. E. Smirnov, F. W. Speigel, and M. F. J. R. Taylor. 2005. The new higher level classification of Eukaryotes with emphasis on the taxonomy of Protists. Journal of Eukaryotic Microbiology 52(5): 399–451. Retrieved August 23, 2008. Bernhard, J. M., and S. M. Bowser. 1999. Benthic foraminifera of dysoxic sediments: Chloroplast sequestration and functional morphology. Earth Science Reviews 46: 149–165. Retrieved August 23, 2008. Boardman, R. S., A. H. Cheetham, and A. J. Rowell. 1987. Fossil Invertebrates. Palo Alto: Blackwell Scientific Publications. ISBN 0865423024. Cavalier-Smith, T. 2003. Protist phylogeny and the high-level classification of Protozoa. European Journal of Protistology 34(4): 338–348. Retrieved August 23, 2008. Crowley, T. J., and J. C. Zachos. 2000. Comparison of zonal temperature profiles for past warm time periods. Pages 50 to 76 in B. T. Huber, K. G. Macleod, and S. L. Wing, eds., Warm Climates in Earth History. Cambridge University Press. ISBN 052164142X. Retrieved August 23, 2008. Dartnell, L. 2008. Sea creatures had a thing for bling. New Scientist May 8, 2008. Retrieved August 23, 2008. Hemleben, C., M. Spindler, and O. R. Anderson. 1989. Modern Planktonic Foraminifera. Springer-Verlag. ISBN 0387968156. Integrated Taxonomic Information System (ITIS). 2003. Foraminiferida ITIS Taxonomic Serial No. : 44030. Retrieved August 22, 2008. Kennett, J. P., and M. S. Srinivasan. 1983. Neogene Planktonic Foraminifera: A Phylogenetic Atlas. Stroudsburg, PA: Hutchinson Ross. ISBN 0879330708. Kucera, M., and K. F. Darling. 2002. Genetic diversity among modern planktonic foraminifer species: Its effect on paleoceanographic reconstructions. Philosophical Transactions of the Royal Society of London A360(4): 695–718. Langer, M. R., M. T. B. Silk, and J. H. Lipps. 1997. Global ocean carbonate and carbon dioxide production: The role of reef foraminifera. Journal of Foraminiferal Research 27(4): 271–277. Retrieved August 23, 2008. Olney, M. 2002. Foraminifera Microfossil Image Recovery and Circulation for Learning and Education (MIRACLE), University College London (UCL), Micropalaeontology Unit. Retrieved August 22, 2008. Schweizer, M. 2006. Evolution and Molecular Phylogeny of Cibicides and Uvigerina (Rotaliida, Foraminifera). Geologica Ultraiectina No. 261. ISBN 905744125X. Retrieved August 23, 2008. Schweizer, M., J. Pawlowski, T. J. Kouwenhoven, J. Guiard, and B. van der Zwaan. 2008.Molecular phylogeny of Rotaliida (Foraminifera) based on complete small subunit rDNA sequences. Marine Micropaleontology 66 (3): 233. Sen Gupta, B. K. 1999. Modern Foraminifera. Springer. ISBN 0412824302. Wetmore, K. L. 1995. Introduction to the Foraminifera. University of California Museum of Paleontology. Retrieved August 23, 2008. Zachos, J. C., M. Pagani, L. Sloan, E. Thomas, and K. Billups. 2001. Trends, rhythms, and aberrations in global climate, 65 Ma to present. Science 292: 686–693. PMID 11326091. Retrieved August 23, 2008. Illustrated glossary of terms used in foraminiferal research – is the Lukas Hottinger's glossary published in the OA e-journal "Carnets de Géologie - Notebooks on Geology". Benthic foraminifera information – from the 2005 Urbino Summer School of Paleoclimatology. Foraminifera Gallery – Illustrated catalog of recent and fossil Foraminifera by genus and locality. This page was last modified on 18 April 2017, at 19:43.